Over the past 29 years, Pru Porretta, as Coventry’s present-day Lady Godiva, has reached out to various ethnic, cultural and faith communities in the city of Coventry and beyond. She has shared with schools, community groups and individuals the story that lies at the heart of Coventry. She has brought Lady Godiva alive for both children and adults. She wants to build community cohesion by including the history, culture and values of other communities in Coventry. She asked them to choose a heroine, who represents that community in a wider context. Working-groups were set up to design and create, with guidance from a textile artist, banners depicting each heroine in an appropriate style. One member of each group was chosen to be that heroine and to become a Godiva Sister. 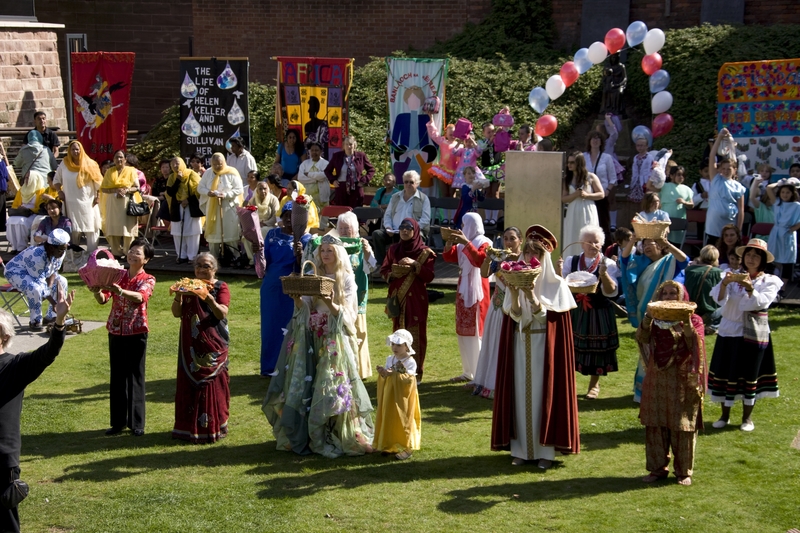 This year the annual Godiva Sisters event will take place on Friday 9 September 2011 beginning at 11.00 am. Lady Godiva and her Sisters are characters both ancient and modern, whose lives can still inspire us today. The event is free of charge, but people are asked to bring something to share for the picnic lunch. There will be a procession from the Cathedral ruins through Broadgate and down into the Lower Precinct with drumming, banners and umbrellas. Local schools and community groups provide music and dancing to create a colourful and dramatic spectacle. There are several ways in which you might take part in the event this year and we hope that you will make your own proposals about what might be possible for you. The event takes place at the beginning of next term, so we are hoping that we can visit you and make plans with you now before the summer holidays. This year there will be a wreath laying ceremony in the Cathedral ruins as a commemoration of the Lady Godiva’s death on 10 September 1067. Community groups and schools are invited to create their own wreath (ancient or modern style) to be placed in the ruined sanctuary in commemoration of Godiva. If you are able to join us for the event this year, please contact the Godiva Association and let us know. We welcome those who would like to perform and others who just like to be part of the event.